This year saw the 200th anniversary of the seminal slaughterfields of Waterloo, in which Napoleon Bonaparte was narrowly defeated by the Duke of Wellington in the only time those two lords of battle met. 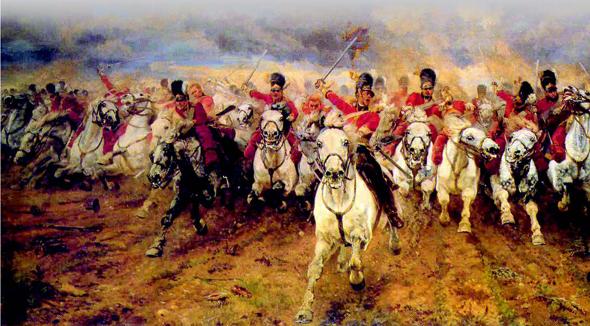 At Wellington’s army was a hotch-potch mixture of British, Germans, Dutch & Belgians, a risky force to face the veterans of Napoleon’s twenty years of constant warfare. 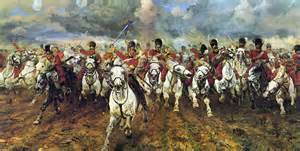 Among them were the Roytal Scots Draggon Guards – the Scots Greys – Europe’s finest horsemen, who in a legendary charge cut through the main attacking column of the French like a knife through butter, early in the afternoon. Napoelon looked on aghast as his dream of taking the plateaux of Mont Saint-Jean crumbled under the sabre-slash & heavy hooves of the Greys. The battle rolled on for the rest of the day, but it was this vital charge that really put an end to Napoleon’s empirical contagion. In this account of the battle, from the Grey’s perspective, Iain Gale brings us directly into the regiment itself, as if we were riding on our own Grey throughout the campaign. This effect is greatly helped by lovely wee touches, such as the troopers struggling with their fur caps & the weeping of French artillery men as they were savaged by the Greys. Gale is a writer of novels, & it is refreshing to get a lively & novelistic account of Waterloo beyond the rigid histories of academics. Throughout the book, Gale’s prose is pleasant, & his story-telling succinct, which comes from a 40-year erudite sojourn through the Napoleonic Wars. 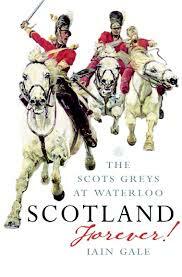 The title comes from Lady Butler’s famous painting, which depicts the Greys at that vital junction of Waterloo.